I normally like to stay on top of posts and it’s been a while since I’ve written. I took the summer and fall to reflect and take a deeper look into myself. It’s been a tough year, losing our baby Max was devastating. It helped to write for a while but then I lost my inspiration. I wanted to write and wrote drafts, but everything I wrote sounded like a complaint, which isn’t normal for me. Then I realized, dealing with celiac disease is sort-of one large complaint, for those with the disease and everyone around them. I used to be a happy-go-lucky, balls-in-the-air, multi-tasking maverick, but celiac disease has caused holes in my memory and no energy to do the everyday things. I got pregnant on our trip back East, we began work on a big project and launched a new website when we returned and those things kept me very busy. I couldn’t find time to work on my crafts and have a slew of unfinished projects in the works. My house is a mess, dishes pile up in the sink, laundry goes undone for weeks. I want my energy back! Energy comes in short spurts and doesn’t last long, I have a few hours up or out and then I have trouble smiling through the pain. 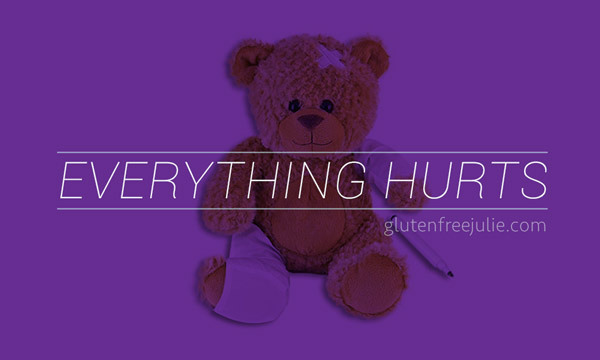 All that affects me with celiac also affects everyone around me, because it can be difficult to control my responses when I’m trying to manage the pain. There are highs and lows we celiacs go through, ups and downs like being on a constant roller coaster. Usually I’m an outgoing, fun, happy person but I have cycles where I’m negative, depressed and not able to socialize. We lose friends and close contact with loved ones, because the celiac changes you. The ones who do stick around will tell you to stop saying the word ‘sorry,’ as apologizing becomes a serial habit. In my last topic, I wrote about not only accepting your celiac diagnosis, but fully surrendering to celiac disease. It’s a life-long battle, I constantly talk myself out of pitying my situation – especially at the grocery store. I said to my Hubbs the other night that it’s not like it’s the end of the world, but I REALLY miss good pizza, ice cream, soft pretzels and cheesesteaks. Not that it’s food that is particularly good for you, but once in a while it would be nice to indulge without serious consequences. He told me it might as well be the end of my world, never being able to eat my favorite foods ever again. And that’s how people feel, that it’s the end of the world. They’ve told me they would rather shoot themselves in the head or jump off a cliff than never eat gluten again. I thought that was a bit extreme – I mean come on, there are other foods out there and at least I got to enjoy them for a while, but it does kinda feel like a life-sentence. Celiac disease does make life difficult, but it’s slowly getting easier as more and more grocery stores and restaurants embrace gluten-free foods. Here’s hoping it only continues to get easier to safely eat food without worry of cross-contamination or getting seriously sick.